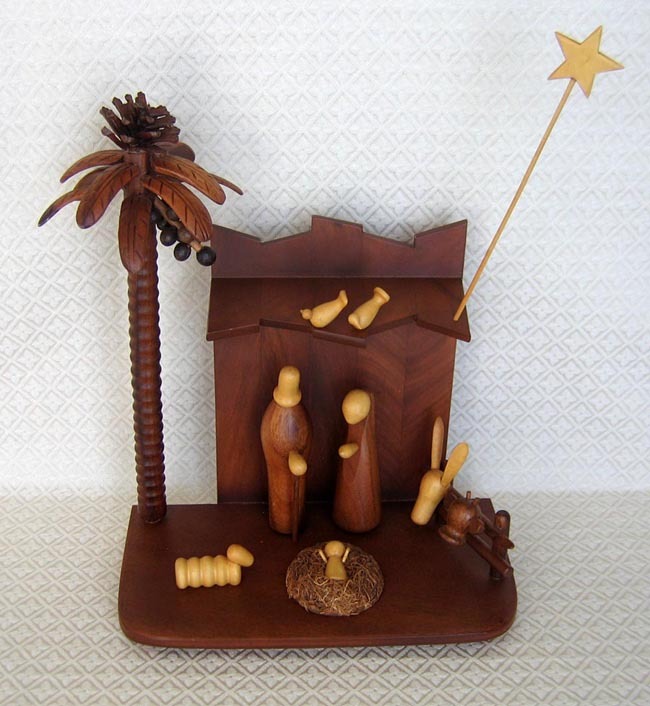 This Nativity from the Philippines depicts the Holy Family carved in a modern, abstract style. Light and dark woods are blended for contrast (the light wood is acacia). The Family is joined in the stable by a donkey, a cow, a lamb, and two birds overhead. A tall coconut tree and star complete the scene. The coconut tree has a pine cone on top. The base of the stable measures 13 inches wide by 7 inches deep. The coconut tree measures 15 inches tall. The set was made by a group of handicapped people employed by De Los Reyes Homecraft International. This firm began in 1969 by making wooden plates and bowls until 1976. Then the product line was diversified to include wooden musical instruments, including pianos and guitars, as well as wooden gifts such as Nativity sets. The firm has an office in Quezon City and a factory at Meycauayan, Philippines.